vol.9　see all recipes I’ve put together a series of tasty recipes for healthy Japanese dishes that are simple to make, wherever in the world you might be. I hope you’ll enjoy mastering Japanese home cooking while learning how to use ingredients that are good for health and beauty. 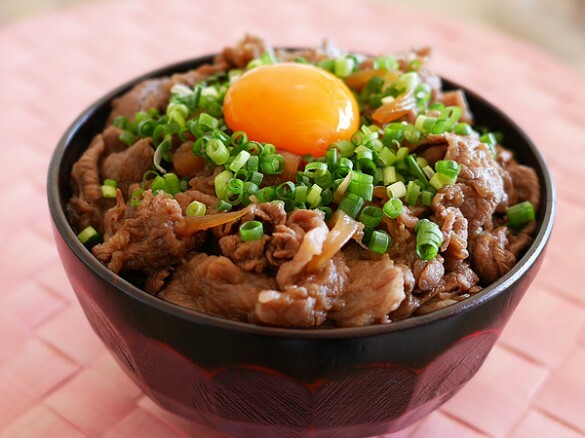 Gyudon is a nourishing dish of beef on rice. Even now, it remains a perennial favorite with both men and women, at home and abroad. 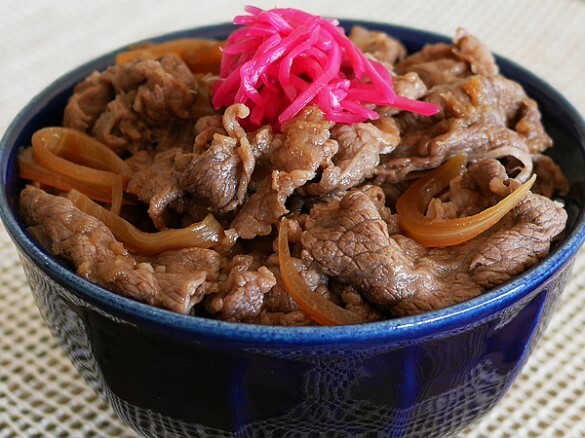 It has recently been in the news because major gyudon restaurant chain Yoshinoya announced that a study(*) had shown that there was no increased risk to health as a result of eating gyudon every day for three months. Certainly, it is easy to cook and the ingredients simple to obtain. You could go so far as to describe it as a healthy meat dish that does not use too much oil. 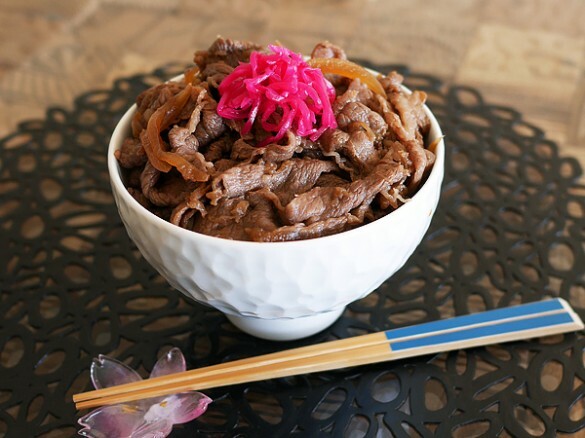 There is a strong perception of gyudon as a quick, cheap, and tasty dish, but if you make it at home, you can turn it into something extraordinarily delicious. Just follow these three tips and you’ll be amazed at how tender and juicy even cheap beef can be. (1)Don’t overcook the meat. Simmer the beef briefly for the last 2 minutes of cooking time. (2)Don’t use shirataki (konjac) noodles, as these make the meat tough. 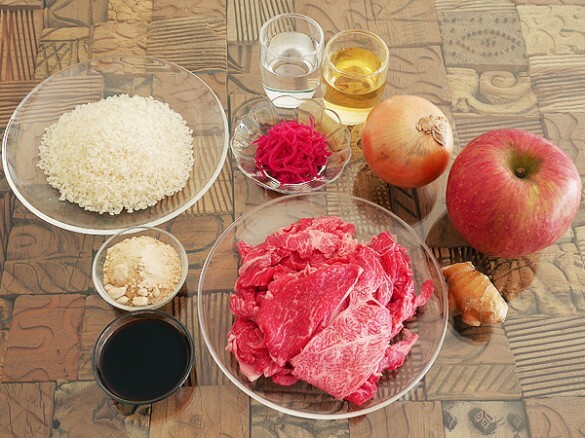 (3)Use grated apple to make the beef softer and more moist. 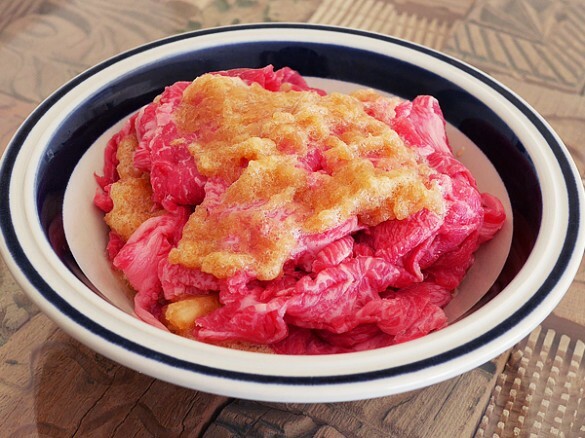 ・Thinly sliced beef (offcuts, etc.) 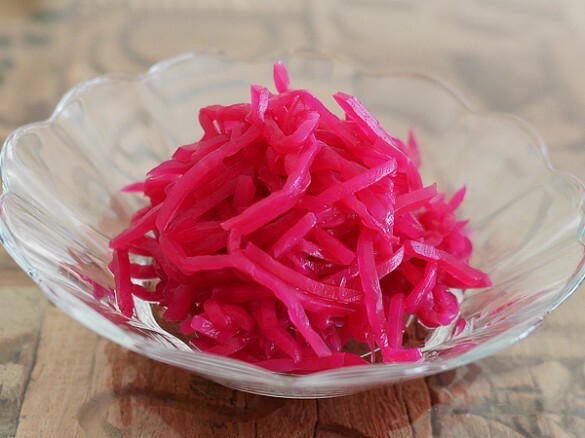 200g ・Onion Half ・Apple Quarter ・Ginger About 3cm ・Soy sauce 2 tablespoons ・Sugar 2 tablespoons ・White wine 100ml ・Water 100ml ・Beni-shoga (red pickled ginger*) To taste ・Cooked rice As needed *Traditionally, beni-shoga is regarded as playing a crucial supporting role as a garnish, not merely to add color, but also to eliminate any unpleasant odors in the meat and boost circulation in the body. (1)Wash the rice and cook until still firm. Grate the apple and add to the meat, then leave at room temperature for 30-60 minutes. 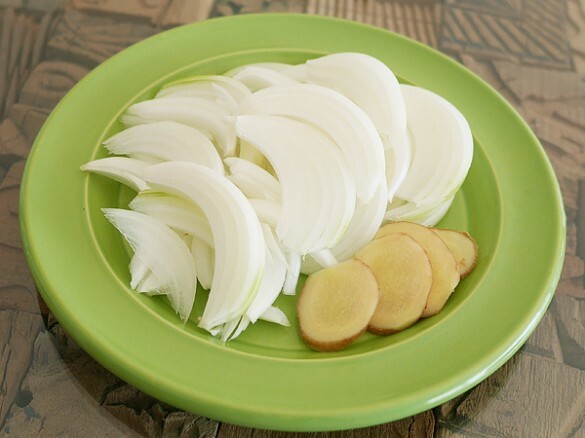 (2)Cut the onion and the ginger into thin slices. 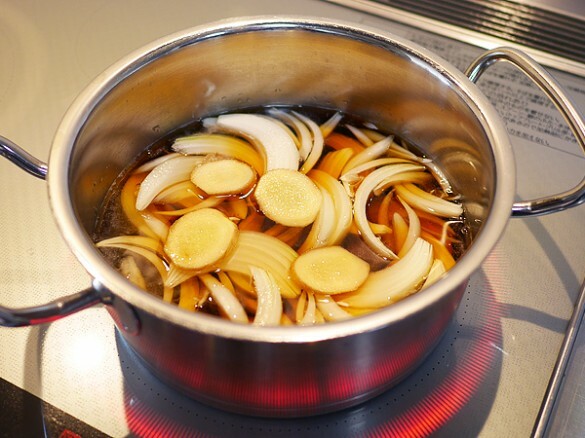 (3)Place the soy sauce, sugar, white wine, and water in a saucepan, then add the onion and ginger and heat them. Once the mixture boils, lower the heat to medium and simmer for 15 minutes. (4)Add the beef and apple mixture (including the juice) to the pan and heat briefly. You must not use a high heat for this; place on a medium heat for about 2 minutes and once the meat has lost its pink color, turn the heat off, put a lid on the saucepan, and leave to cook in the residual steam for 2-3 minutes. 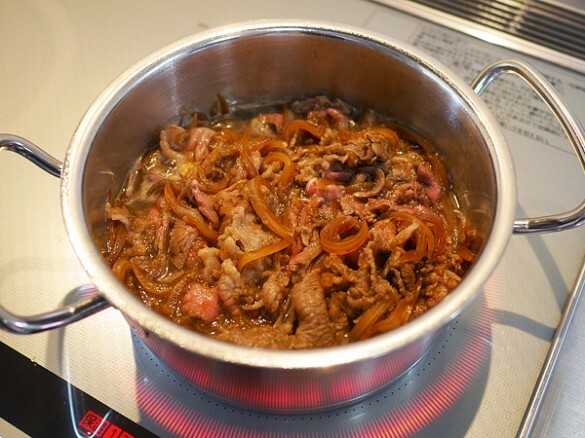 (5)Put the freshly cooked rice into large bowls (known as donburi in Japanese), then pile the meat and onion mixture on top and it’s ready to eat. Serve with beni-shoga. (6)If you wish, you can top it with green spring onion and egg yolk for a mellow, aromatic flavor. Shichimi chili pepper is also good with gyudon. *Study of Long-term Consumption of Yoshinoya Gyudon Ingredients http://v4.eir-parts.net/v4Contents/View.aspx?cat=tdnet&sid=1309848 TEXT,PHOTO/SUGI AKATSUKI see all recipes Profile:SUGI AKATSUKI Graduate of the University of Tokyo. Researches culinary culture and foods that promote longevity and beauty. Studied basic medical science and life science at university. After studying organic food and Kushi macrobiotics, she began to conduct culinary research independently. Her motto is “simple ways to stay beautiful.” Her specialty is healthy dishes ideal for the busy woman of today. She also teaches yoga and has a popular blog（http://saqai.com/）.